Water for the Environment: From Policy and Science to Implementation and Management provides a holistic view of environmental water management, offering clear links across disciplines that allow water managers to face mounting challenges. 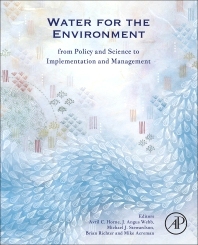 The book highlights current challenges and potential solutions, helping define the future direction for environmental water management. In addition, it includes a significant review of current literature and state of knowledge, providing a one-stop resource for environmental water managers. Avril Horne is an environmental water policy specialist, currently working in the Environmental Hydrology and Water Resources Group in the Department of Infrastructure Engineering at the University of Melbourne. Avril has experience across a range of interdisciplinary projects in water resource management challenges having spent time in consulting, government, and academia. She was heavily involved in the development of the water trading rules for the Murray-Darling Basin Plan. Avril returned to academia in 2014, and is currently working on projects developing tools and systems to assist in the active management of environmental water. Dr. Angus Webb is a Senior Lecturer in Environmental Hydrology and Water Resources at the University of Melbourne, Australia. He originally trained as a marine ecologist before moving into the study and restoration of large-scale environmental problems in freshwater systems. Much of his research centers on improving the use of the existing knowledge and data for such problems. To this end he has developed innovative approaches to synthesizing information from the literature, eliciting knowledge from experts, and analyzing large-scale data sets. His teaching at the University of Melbourne is focused on monitoring and evaluation in aquatic systems. Angus is heavily involved in the monitoring and evaluation of ecological outcomes from environmental water delivered under the Australian government’s Murray-Darling Basin Plan, leading the program for the Goulburn River, Victoria, and advising on data analysis at the basin scale. Angus has authored over 100 publications in the international literature, including 58 journal papers. In addition to this book, he is currently editing two journal special issues on different aspects of environmental water science and management, and is an Associate Editor for the journal Environmental Management. He was awarded the 2013 prize for Building Knowledge in Waterway Management by the River Basin Management Society in Australia, and the 2012 Australian Society for Limnology Early Career Achievement Award. Over the last 24 years, Prof. Michael Stewardson’s research has focused on interactions between hydrology, geomorphology and ecology in rivers (http://www.findanexpert.unimelb.edu.au/display/person14829). This has included physical habitat modelling, flow-ecology science, and innovation in environmental water practice. Michael has participated in Australia’s water reforms through advisory roles at all levels of government. More recently, his research has focused on the physical, chemical and biological processes in streambed sediments and their close interactions in regulating stream ecosystem services. He leads the Environmental Hydrology and Water Resources Group in Infrastructure Engineering at The University of Melbourne (http://www.ie.unimelb.edu.au/research/water/). Brian Richter has been a global leader in water science and conservation for more than 30 years. After leading The Nature Conservancy’s global water program for two decades, he now serves as President of Sustainable Waters, a global water education organization. In this role, Brian also promotes sustainable water use and management with governments and local communities, and serves as a water advisor to some of the world’s largest corporations, investment banks, and the United Nations, and has testified before the U.S. Congress on multiple occasions. Brian has consulted on more than 150 water projects worldwide. He also teaches a course on Water Sustainability at the University of Virginia. Brian has developed numerous scientific tools and methods to support river protection and restoration efforts, including the Indicators of Hydrologic Alteration software that is being used by water managers and scientists worldwide. Brian was featured in a BBC documentary with David Attenborough on “How Many People Can Live on Planet Earth?” He has published many scientific papers on the importance of ecologically sustainable water management in international science journals, and co-authored a book with Sandra Postel entitled Rivers for Life: Managing Water for People and Nature (Island Press, 2003). His new book, Chasing Water: A Guide for Moving from Scarcity to Sustainability, has now been published in six languages. Mike Acreman is Science Area Lead on Natural Capital at the Centre for Ecology and Hydrology, Wallingford, UK and visiting Professor of Eco-hydrology at University College London. He has over 30 years research experience at the interface of hydrology and freshwater ecology. His PhD was on flood risk estimation at the University of St Andrews. He worked for the Institute of Hydrology as a flood modeller. In the 1990s he was freshwater management advisor to the IUCN-The World Conservation Union. He has worked in numerous countries worldwide for DFID, The World Bank, European Commission, IUCN, Ramsar Convention, Biodiversity Convention and national governments. At CEH he leads a team of 40 scientists studying catchment processes, river ecology and wetland hydrology. Prof Acreman’s specialist interests include hydro-ecological processes in wetlands and definition of ecological flow requirements of rivers, particularly at extremes of floods and droughts. He led the World Bank programme on environmental flows and was hydrological advisor to DFID with major input to the World Commission on Dams. He is a member of the WWF-UK board, the Ramsar Convention science panel and is a member of the Natural England Science Advisory Board. He is co-Editor of Hydrological Sciences Journal and edited Special Issues on Ecosystem Services of Wetlands and Environmental Flows and has published over 170 scientific papers.